Just saw this advertisement on BBC website while checking my morning dose of news. I was quite fascinated by this ad. Immediately started to think “Oh this is great! !” now I can get a great coffee to start my day at home by pressing a button. If you are not familiar with this machine or not a coffee person this machine uses special coffee capsules to dispense coffee. There are varieties of flavor to choose from and trust me it really makes great coffee. In India tea is most preferred drink and most of people like to take it with lots of milk. Similarly coffee drinkers also prefers latte instead of “espresso” – sorry I am really addicted and spoiled and not quite human at work unless I get my dark coffee. well i know its an old post .. and i am posting a reply for this too late ..
just that i was searching for coffee - espresso in India , i found your blog ! But aint it true that all good things come with a cost ? 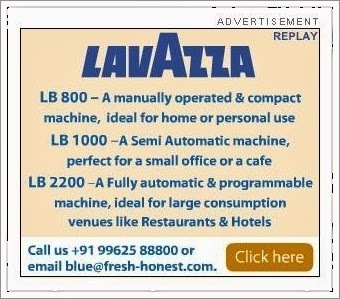 :) It surely is worth paying so much for something good as Lavazza ! Anyways hope you do enjoy your cuppa soon .. :) from the touch machines. I demo'ed the same machine - didnt think the coffee was good enough to warrant 25 rs a cup! The other problem I had with the machine is that since the capsules/pods are Lavazza specific, I will be at their mercy for as long as I own it. But that's a 'pod-issue' in general. @AG: I can't agree more.